Just a few days ago, a new vulnerability allowing an unprivileged user to run #DB handler with user-mode GSBASE was found by Nick Peterson (@nickeverdox) and Nemanja Mulasmajic (@0xNemi). At the end of the whitepaper they published on triplefault.io, they mentioned that they were able to load and execute unsigned kernel code, which got me interested in the challenge; and that’s exactly what I’m going to attempt doing in this post. Before starting, I would like to note that this exploit may not work with certain hypervisors (like VMWare), which discard the pending #DB after INT3. I debugged it by “simulating” this situation. Final source code can be found at the bottom. The fundamentals of this exploit is really simple unlike the exploitation of it. When stack segment is changed –whether via MOV or POP– until the next instruction completes interrupts are deferred. This is not a microcode bug but rather a feature added by Intel so that stack segment and stack pointer can get set at the same time. However, many OS vendors missed this detail, which lets us raise a #DB exception as if it comes from CPL0 from user-mode. We can create a deferred-to-CPL0 exception by setting debug registers in such a way that during the execution of stack-segment changing instruction a #DB will raise and calling int 3 right after. int 3 will jump to KiBreakpointTrap, and before the first instruction of KiBreakpointTrap executes, our #DB will be raised. As it is mentioned by the everdox and 0xNemi in the original whitepaper, this lets us run a kernel-mode exception handler with our user-mode GSBASE. Debug registers and XMM registers will also be persisted. This example is 32-bit for the sake of showing ASM and C together, the final working code will be 64-bit. Now let’s start debugging, we are in KiDebugTrapOrFault with our custom GSBASE! However, this is nothing but catastrophic, almost no function works and we will end up in a KiDebugTrapOrFault->KiGeneralProtectionFault->KiPageFault->KiPageFault->… infinite loop. 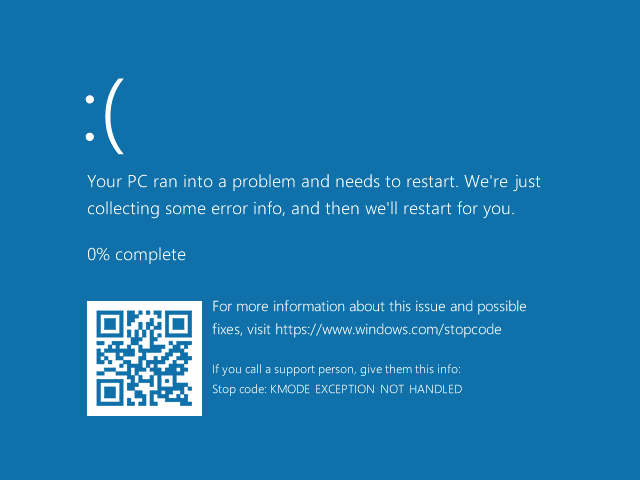 If we had a perfectly valid GSBASE, the outcome of what we achieved so far would be a KMODE_EXCEPTION_NOT_HANDLED BSOD, so let’s focus on making GSBASE function like the real one and try to get to KeBugCheckEx. Pcr.Prcb.MxCsr needs to have a valid combination of flags to pass this instruction or else it will raise a #GP. So let’s set it to its initial value, 0x1F80. Pcr.Prcb.CurrentThread is what resides in gs:188h. We are going to allocate a block of memory and reference it in gs:188h. This is Pcr.Prcb.CurrentThread.ApcStateFill.Process and again we are going to allocate a block of memory and simply make this pointer point to it. 0x20 from GSBASE is Pcr.CurrentPrcb, which is simply Pcr + 0x180. Let’s set Pcr.CurrentPrcb to Pcr + 0x180 and also set Pcr.Self to &Pcr while on it. This one is going to be a little bit more detailed. RtlDispatchException calls RtlpGetStackLimits, which calls KeQueryCurrentStackInformation and __fastfails if it fails. The problem here is that KeQueryCurrentStackInformation checks the current value of RSP against Pcr.Prcb.RspBase, Pcr.Prcb.CurrentThread->InitialStack, Pcr.Prcb.IsrStack and if it doesn’t find a match it reports failure. We obviously cannot know the value of kernel stack from user-mode, so what to do? Thanks to this check, as long as we make sure KThread.InitialStack (KThread + 0x28) is not equal to Pcr.Prcb.RspBase (gs:1A8h) KeQueryCurrentStackInformation will return success with 0xFFFF800000000000-0xFFFFFFFFFFFFFFFF as the reported stack range. Let’s go ahead and set Pcr.Prcb.RspBase to 1 and Pcr.Prcb.CurrentThread->InitialStack to 0. Problem solved. RtlDispatchException after these changes will fail without bugchecking and return to KiDispatchException. Pcr.CurrentPrcb->Context is where KeBugCheck saves the context of the caller and for some weird reason, it is a PCONTEXT instead of a CONTEXT. We don’t really care about any other fields of Pcr so let’s just set it to Pcr+ 0x3000 just for the sake of having a valid pointer for now. And there we go, sweet sweet blue screen of victory! Now that everything works, how can we exploit it? The code after KeBugCheckEx is too complex to step in one by one and it is most likely not-so-fun to revert from so let’s try NOT to bugcheck this time. This means that we have to find a way to write to kernel-mode memory and abuse that instead. RtlCaptureContext will be a tremendous help here. As I mentioned before, it is taking the context pointer from Pcr.CurrentPrcb->Context, which is weirdly a PCONTEXT Context and not a CONTEXT Context, meaning we can supply it any kernel address and make it write the context over it. After playing around with g_CiOptions for 1-2 days, I thought of a much better idea: overwriting the return address of RtlCaptureContext. How are we going to overwrite the return address without having access to RSP? If we use a little bit of creativity, we actually can have access to RSP. We can get the current RSP by making Prcb.Context point to a user-mode memory and polling Context.RSP value from a secondary thread. Sadly, this is not useful by itself as we already passed RtlCaptureContext (our write what where exploit). However, if we could return back to KiDebugTrapOrFault after RtlCaptureContext finishes its work and somehow predict the next value of RSP, this would be extremely abusable; which is exactly what we are going to do. To return back to KiDebugTrapOrFault, we will again use our lovely debug registers. Right after RtlCaptureContext returns, a call to KiSaveProcessorControlState is made. We will set DR1 on gs:20h + 0x100 + 0xA0, and make KeBugCheckEx return back to KiDebugTrapOrFault just after it saves the value of CR4. To overwrite the return pointer, we will first let KiDebugTrapOrFault->…->RtlCaptureContext execute once giving our user-mode thread an initial RSP value, then we will let it execute another time to get the new RSP, which will let us calculate per-execution RSP difference. This RSP delta will be constant because the control flow is also constant. Now that we have our RSP delta, we will predict the next value of RSP, subtract 8 from that to calculate the return pointer of RtlCaptureContext and make Prcb.Context->Xmm13 – Prcb.Context->Xmm15 written over it. Now we simply need to set-up a ROP chain and write it to XMM13-XMM15. We cannot predict which half of XMM15 will get hit due to the mask we apply to comply with the movaps alignment requirement, so first two pointers should simply point at a [RETN] instruction. We need to load a register with a value we choose to set CR4 so XMM14 will point at a [POP RCX; RETN] gadget, followed by a valid CR4 value with SMEP disabled. As for XMM13, we are simply going to use a [MOV CR4, RCX; RETN;] gadget followed by a pointer to our shellcode. We can’t restore any registers so we will make the thread responsible for the execution of vulnerability store the context in a global container and restore from it instead. Now that we executed our code and returned to user-mode, our exploit is complete! P.S. : If you want to try this exploit out, you can uninstall the relevant update and give it a try! The exploit may not work with certain hypervisors (like VMWare), which discard the pending #DB after INT3. Please share the debugging method. so what is this “fffff00e`d7a1bc60 0000000000000014” ?? Thank you. It is stack alignment. I just find it in Intel Manual 6.14.2 64-Bit Mode Stack Frame. But in this way, the REAL_TIME watchdog thread was hard to get scheduled. When I force to set the context pointer to point to the kernel stack, I can run to the kernel shell code by ROP. Hi, bro! Your work is so good. i’m a newcomer to kernel exploit. I have some questions after reading your article. ONE. How to ,can u explain in more details? TWO. As im new to this area, what is the basic knowledge I need to prepare, do you have some good books or articles to recommand for me? I would appreciate for your precious reply. I’m a newbee too. but I did some work about the CVE. I think maybe it is useful to you..
http://x86asm.net/articles/debugging-in-amd64-64-bit-mode-in-theory/ –> You could know some details about interrupts and exceptions, debug register. I think maybe you could read the article first. Because I think it is very useful. https://github.com/nmulasmajic/CVE-2018-8897 –> POC from the finder.. I read it to know why the author know how to write EXP without any details..but I can’t. I’m sorry. My English is so terrible… ^_^…….. .
Hello, thanks for your work.! When I read your code from github, I could understand HANDLE(-2), I can’t understand that. The value must be -2? Maybe I’m not good at google…I can’t find any answer about the value “-2″…. I’m sorry, my English is terrible…Looking forward to your reply! Then I run the instruction in windows 10(64bit), of course. The instruction work. Could you give me some tips.. Thank you very much. And when I run your code. The code [i], [i+3],[i+7] , I think maybe it is lack of Versatility. I need to change the code like this and it will work. Offset_KThread__ApcStateFill__Process = (0x70); //I find the offset is 0x70, so I change it directly. Use number 4 instead of 7. I think have another method to run the code correctly in differcnt machines? I’m sorry….I try not to ask such a stupid question again.Thank U.
I’m very sorry. I think maybe I get the answer from your github. I will try the mothods. Thank you!! !